Pricing diamonds is extremely difficult and twice as hard when it comes to fancy colored diamonds. Christie’s has concluded their Magnificent Jewels auction in Hong Kong, and despite weak sales they have still emerged with several fancy color diamonds that exceeded expectations. 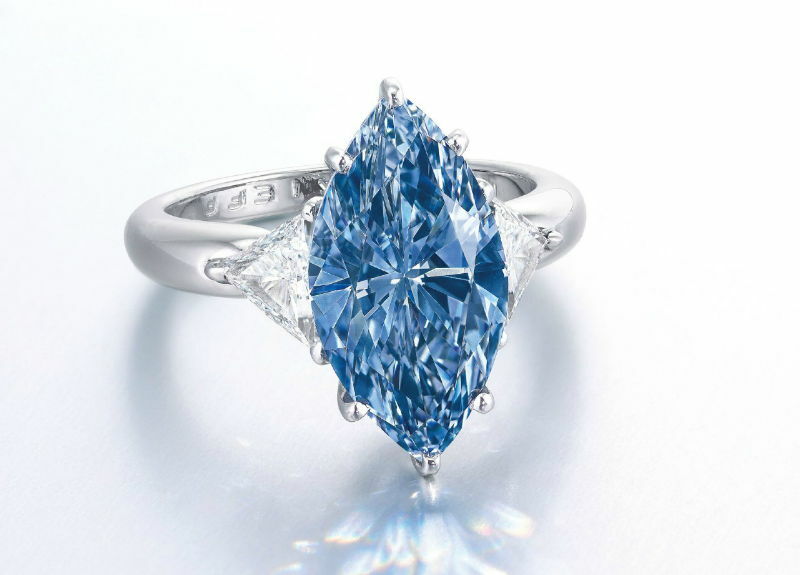 The highlight of the auction was the 4.29 carat Fancy Vivid Blue IF marquise shaped diamond that was offered by famous London jeweler Moussaieff, and it did not disappoint with its results. Another blue diamond, along with a yellow diamond and a pink diamond exceeded their price estimates as well, which was a positive indication of the state of demand for fancy color diamonds. The Blue Diamond to Rule Them All? The 4.29 carat Fancy Vivid Blue IF diamond ring by Moussaieff sold for $11.8 million, or $2.755 million per carat. While this is not the most expensive blue diamond ever sold, it is certainly a high price for such a diamond, although it can be justified by the fact that its color is a magnificent blue and that its clarity is a near perfect Internally Flawless. Its price earned it two new record titles, the most expensive Fancy Vivid Blue diamond of 3-5 carats ever sold, and the most expensive price per carat for a Fancy Vivid Blue diamond of 3-5 carats. The Blue Moon of Josephine remains The most expensive blue diamond ever sold. The diamond which sold last year at auction in Geneva for $48.5 million, and the most expensive blue diamond of 2016 was the Sky Blue diamond which sold two weeks ago in Geneva for $17 million. A surprise for the evening was the final price for the 28.78 carat Fancy Vivid Yellow VVS1 emerald cut diamond. Yellow diamond rings have a steady demand, but as a general rule their auction prices do not often exceed the auction house’s high estimates simply because they are not as rare as other colors. 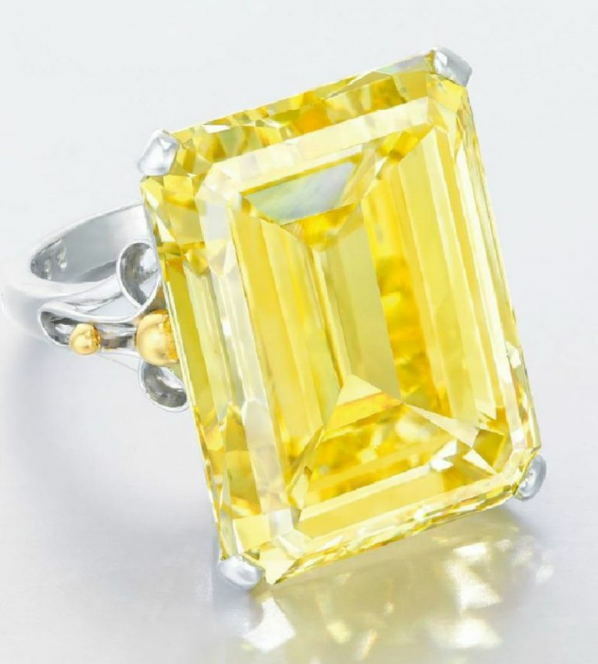 Nevertheless, it sold for $2,028,708 or $70.5k per carat, a 35% premium over its $1.1 million to $1.5 million estimate. This confirms that yellow diamond value remains strong in the current market. A diamond’s color and its intensity has a strong impact on its pricing – especially in colored diamonds. However, the beauty of auctions is that demand is purely what drives the price of any particular item. In this case a fancy blue diamond performed very nicely! A 5.19 carat Fancy Blue Diamond IF pear shaped diamond and it sold for $1,717,795 or $331k per carat. Considering that its estimation was between $900k to $1.15 million, its premium was 49%. By now, it’s no doubt that pink diamonds are always in fashion! A 2.13 carat Fancy Intense Pink I1 diamond was auctioned together with a 2.21 carat G Color VS2 diamond as an interesting double-diamond ring. The two diamonds are of modest sizes and the auction house estimated the ring to sell at a price between $125k to $190k. It sold for $551,871 or $259k per carat, value that can be entirely attributed to the pink diamond there. Not only did the ring sell for a 190% premium over the high estimate, it set a record that evening. The previous most expensive Fancy Intense Pink 2-3 carat diamond was sold for $178k per carat, so the $259k price per carat is a 45% premium over the last record. Pink and blue diamonds never cease to draw in big name bidders at the important diamond auctions. Time and again, the bar is set higher and higher as the demand for the best diamonds in the world grows larger. It remains to be seen how far these bidders will be willing to go in the years to come! What do you think? Can these price trends continue to rise? Does it symbolize a recovery for the industry? Are Colored Diamonds more Expensive? Got a Favorite Diamond Color? Naturally Colored by Peled Diamonds, registered diamond dealer and manufacturer, specializing in Natural Fancy Color Diamonds - Member of the NCDIA and IDI. We oﬀer a wide variety of Loose Diamonds at wholesale prices. Create your own diamond rings, diamond engagement rings and other jewelry at half the price.